Good writers know that stories need good pacing. They also understand that there is no one correct pace. Each story requires its own pace. Think about the best movies you’ve seen, the best television shows you’ve watched, the best music concerts you’ve attended, the best standup comedy you’ve heard, the best meal you’ve eaten. Each of them has a pace which maximized your experience. Good game designer is the same. Our understanding of dramatic structure begins with Aristotle’s observations in his text Poetics. It was here that he asserted tragedy must have a beginning, a middle and an end. The beginning–prologue and parados–is for exposition, to introduce the major players and their interrelationships. The middle was filled by alternating short scenes–episodes–and songs–stasimon. The end–exodus–brings resolution to the story. 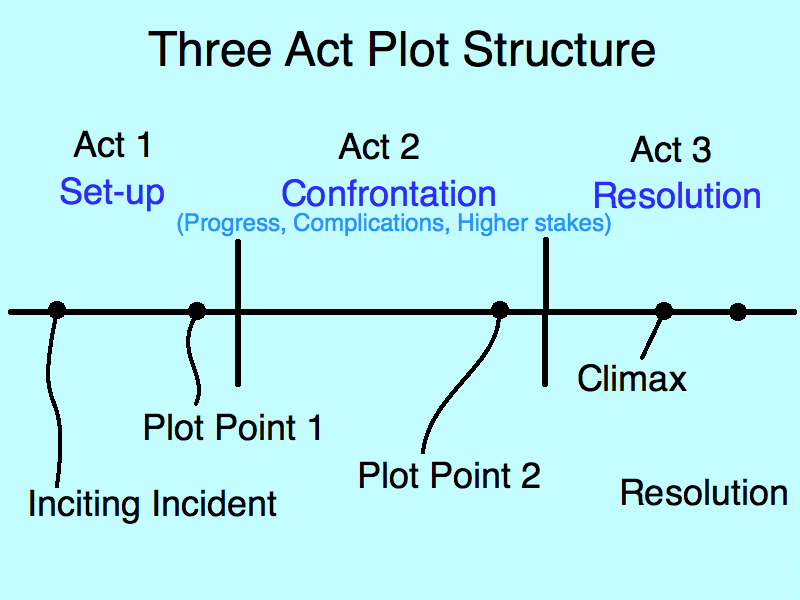 A modern view of the three-act structure uses the first act not only for exposition and introductions but also to confront the protagonist(s) with a major event. The protagonist is now moved (or even forced) to respond. Big Jake’s grandson has been kidnapped. Walter White has cancer and no way to pay for his treatment. Alex Parrish has been framed for a terrorist attack. The second act is filled with rising action. Will Luke rescue princess Leia? Will Ellen kill Herod and thereby avenge her murdered father? Will Inigo find and defeat the six-fingered man? Will Simon steal the statue or will Nicole’s father’s forgery be detected? The protagonist usually begins the second act unable to resolve this issue. She must learn new skills, build new alliances, or find new strength within herself. Resolution arrives in the third act. All forces are brought together into a focal point. The protagonist faces her greatest challenges. Dramatic questions from the second act are answered. The protagonist achieves a new sense of her abilities and her identity. Cage has defeated the alien invasion by becoming the hero the world needed him to be. Rocky Balboa has lasted 15 rounds with Apollo Creed and embraces his beloved Adrian. Batman defeats his surrogate father Ducard and rescues Gotham City. In a game, the player is the protagonist. This makes every part personal. It is you who is confronted with challenges. It is you who must learn new (in-game) skills and build new (in-game) alliances. It is you who must overcome your greatest challenges (often in the form of the other players). Is a three-act structure a useful model for games? I believe that it is. DOOM consumed many hours of my college life. Its play was more compelling than any action game I’d seen before. And its play follows the three-act structure fairly closely. DOOM Act 1 (exposition and introductions, you are forced to respond): What is that? Hey–it wants to kill me! Hey–everything wants to kill me! Hey–even the green water wants to kill me! DOOM Act 2 (learn new skills, finds new strength within yourself): I see better and better weapons. I’m learning to strafe. I’m pushing forward and defeating all of these nasty and disagreeable creatures! DOOM Act 3 (final conflict and resolution): That is one nasty level boss! This is the moment I’ve been playing for. I have bigger guns. I have sharper skills. Either I will destroy that monster or it will destroy me! Zong Shi is a worker placement game I began developing in 2004. My design skills were less sophisticated than they are today but I happened to stumble my way to a three-act structure. Zong Shi Act 1 (exposition and introductions, you are forced to respond): Players draft starting material and event cards. Players decide which projects to build first. Zong Shi Act 2 (learn new skills, finds new strength within yourself): Completed projects give each player special powers. Secrets of alchemy enable players to trade one material type for another. Zong Shi Act 3 (final conflict and resolution): Players push for endgame. Any player with a sixth project completed triggers the endgame but final victory is in the point value of those projects. So some games do exhibit a three-act structure. And as time goes by, I find it increasingly useful to look at each design from this point of view. Must every game fit this structure? I don’t think that’s necessarily the case but if a game does deviate from this structure, it should do so deliberately and thoughtfully. In part 2 of this article, we look at how to maximize the impact of your game by mapping its tension. We will also look carefully at maximizing the quality of playtime in games. What do you think of the three-act structure in games? Would you pace games differently? Did I miss a step? Share with your fellow readers in the comments below. And if you’re enjoying what you’re reading, create an account with WordPress and follow this blog. If you keep reading, I’ll keep writing. This series been one of the most effort-intensive articles I’ve yet written. Three sources were particularly valuable. Jennine Lanouette wrote an excellent summary of the history of the three-act form for a post on Screentakes, her defense of the form in this later post, and Wikipedia’s article on the three-act structure was also a valuable resource.